The Basset Hound is a short legged breed of the hound family. Originating in France it was bred from the bloodhound to hunt rabbits. The name Basset is derived from the French word bas, meaning “low”, with the attenuating suffix -et, together meaning “rather low”. In France, basset hounds rose to the height of popularity during the reign of Emperor Napoleon III (r. 1852-1870). In 1853, sculptor Emmanuel Fremiet exhibited bronze sculptures of Emperor Napoleon III’s basset hounds at the Paris Salon, and ten years later, the Basset Hound reached international fame at the Paris Dog Show. At that time there were two common Bassets, one with a rough coat (Basset Griffon) and a second with a smooth (Basset Français). In 1866, Lord Galway imported a pair of Bassets to England, but it was not until 1874 that Basset Hounds were widely introduced. 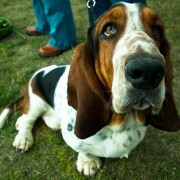 The Kennel Club accepted the breed in 1882 and the English Basset Hound Club was formed in 1884. The American Kennel Club first recognized Basset Hounds as a breed in 1885. In 1935, the Basset Hound Club of America was organized in the United States. The current American breed standard was adopted in 1964. The Basset is a big dog on small legs designed to allow the dog to follow a scent close to the ground in thick brush and dig out the prey. The ears are long and velvet like, and the Basset has droopy brown eyes that are slightly sunken and loose skin around the face. Coat is short, hard, and shiny. Tail is slightly curved, and usually white tipped. Feet are large and heavy with tough pads. Bassets are generally very mild mannered, loyal, and gentle with children. They drool, shed constantly, and their ears and wrinkles require frequent cleaning to avoid infection or chronic disease that can be fatal. Their coat should be brushed regularly and shampooed only when needed. Their nails are difficult to cut, but must be done so frequently. Their eyes need to be wiped every day with a damp cloth because the area under the eyeball will collect dirt and become clogged with a mucus. They tend to be vocal and have a deep, resonating howl. Due to the short length of their legs and heavy long body, they cannot stay afloat in water and should not be allowed to swim. Basset Hounds can be difficult to train due to them being scent driven, but with persistence they make excellent pets. They are highly motivated by food and can easily become lazy and over weight which leads to health problems and a shorter life. Daily exercise and a strict diet are therefore of paramount importance with this breed. Bohemia Horrido – A wealth of breed information and images – well worth a look! Created by dog lovers, for dog lovers. We'd love to hear what you think about the site - just leave a comment or drop us a mail. Woof!